The weather plays a significant role in our lives every day. With the rise of smartphones and weather apps, it’s become easier than ever to check an app for a report on the conditions outside. There’s one big problem with these apps—they’re not always right. Often the weather reports you see in a weather app are from stations miles away from your location. Consequently, there can be significant discrepancies in these reports compared to the actual conditions around you. This is why you should consider a home weather station. 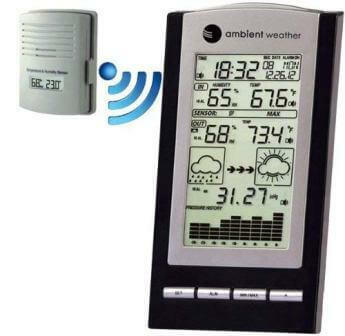 The best home weather stations will do what smartphone apps cannot. They’ll tell you exactly what the weather’s doing at your own home, farm, school or business in real-time by measuring atmospheric conditions, such as temperature, relative humidity, barometric pressure, rainfall, wind speed and direction. They can also connect to the Internet, so you can monitor your weather conditions from anywhere and share your findings with other weather enthusiasts. 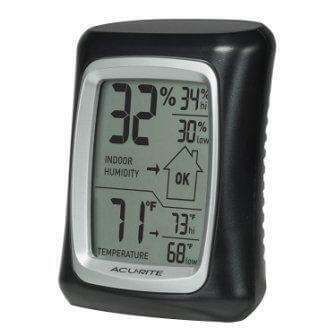 A main reason for the tremendous sales of the AcuRite 00325 is its low price along with the usual set of humidity and temperature sensors, compact body accompanied by a distinct type of screen with user-friendly images. The AcuRite 00325 available at a competitive price and comes with a dual mode for measuring temperature: Fahrenheit and Celsius. The modes can be switched by the press of a button. The data transmitted by the sensors is clearly visible from any angle and from any corner of the space. Another valuable function of the AcuRite 00325 is its ability to log the record limits. It stores the minimum/maximum temperature and humidity levels for a period of 24 / 36 hours. The device runs on one AA battery and is available in three color options: red, blue and black. The only drawback is that the display isn’t backlit and your eyes will strain to read it at night. The range of the temperature sensor is restricted to 0 – 50 deg Celsius. The hygrometer also has a similar range. 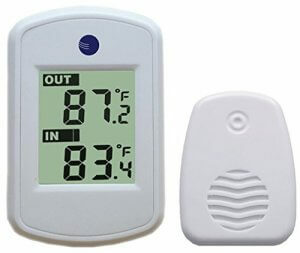 As per the manufacturer, the humidity sensor does not operate if the humidity is below 20% or above 95%. A comment from one of the user Topdoc states: “The humidity sensor accuracy was almost perfect with a minor error of about 4% in the first week, however, the error increased to about 9% during the subsequent week as compared to other weather stations. 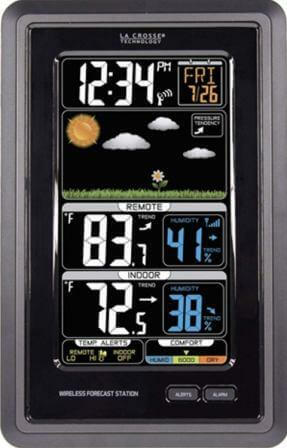 We have come across certain information regarding the defective devices that have a broken hygrometer or a screen, which leads to the inability to show odd numbers. This shortcoming, however, hardly influences the popularity of this weather station. The ratings from users on sites like Amazon are as high as 4.2 stars from a max of 5 stars. The appealing appearance of the AcuRite along with the convenience of use ensures that it remains the highest selling device over the past one year. The brand of the wall clock is digital and it comes along with a thermometer of superior-quality. Well, of course, it isn’t a weather station that is complete. 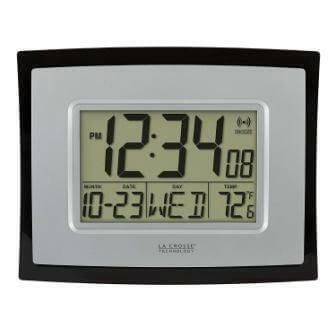 However, the concise technology of La Crosse is highly popular among customers since it was the number one ‘Best Seller’ under the category of Clocks for Weather Monitoring having a star rating of 4.1 / 5. The WT-8002U clock displays both the representations of time i.e. the am and pm as well as the 24-hour, you can select either. It is designed with a big screen and it features graphics that work very well. The clock possesses an inbuilt classic calendar displaying the month, date and week. Mounting lets you set up this clock with the thermometer at any place you like, it could be over the floor surface, on a table or hung on your wall. The device contains an indoor console and an externally fitted sensor-transmitter, which measures the temperature indoors as well as outdoors. The cost of this device is based on the number of consoles. These screens which are compact can be placed in different areas around the house, and the temperature data will be displayed on them. Although the manufacturers claim that the sensor placed outside is not affected by moisture, we still suggest that the thermometer should be hung in a dark and dry place. As a matter of fact, this device is highly recommended by motorists since it is simple, user-friendly and fits easily in the car. The device has been a number 1- Best Seller under the category of Barometers on the website i.e. www.amazon.com. It was among the pioneer stations for weather monitoring, to be equipped with a screen with color animation. It displays clouds running when the weather is cloudy and a sun shining brightly when the weather is sunny and hot. The weather station has a few advantages though it is pretty expensive. The first advantage is that this device can have its external sensor placed at a 300 feet distance. This is sufficient for operating this device in either a huge house or a huge industrial unit. The second advantage is that this device possesses a barometer. This helps to obtain the forecast of the weather some hours prior. Parameters that are measured by the device’s external sensor are atmospheric pressure, humidity and temperature; this is when it is powered using 3 batteries of AAA type. While the inner sensor indicates the humidity level and temperature when it is powered using 2 batteries only. Comfort within the room is also calculated based on the humidity level. Real-time data is displayed as well as there is logging of peak performance. Features like having the ability to adjust the screen brightness, possessing atomic time and a digital calendar are the benefits of this device. Over 80% of the users think that this device is valuable. At times, complaints do get registered with respect to the dimness of the screen during the day, while at night the same screen appears attractive as well as adds to comfort at home, they say. Overall, this device is the best choice for users who wish to know in the morning what kind of clothes they should be wearing for the day. Best for Universal for farmers, grocery cellar owners, winemakers, and home. Careful monitoring of large data is provided by the Ambient device’s interface which is available for a relatively competitive price. It measures dew point and monitors atmospheric pressure, humidity and inside as well as outside temperature along with predicting the weather. Additionally, it displays accurate diagrams of all the historical measurements. It seems much better compared to the affordable devices which only store the maximum performance. This device has a large measurement range and can definitely be suggested to grocery cellar owners, wine makers and farmers. We have arrived at this conclusion after reading about 2300 reviews from customers. Additionally, the device comes with decent night illumination and an atomic type alarm clock. The WS-1171B can be purchased in the silver and black color options.